Ram Truck Brand managers first rolled out their new Laramie Longhorn package at the State Fair of Texas just in time for the annual Red River Rivalry between UT and OU. They followed that with a victory at the Texas Truck Rodeo and a fold-out spread in this year’s SI Swimsuit Edition. 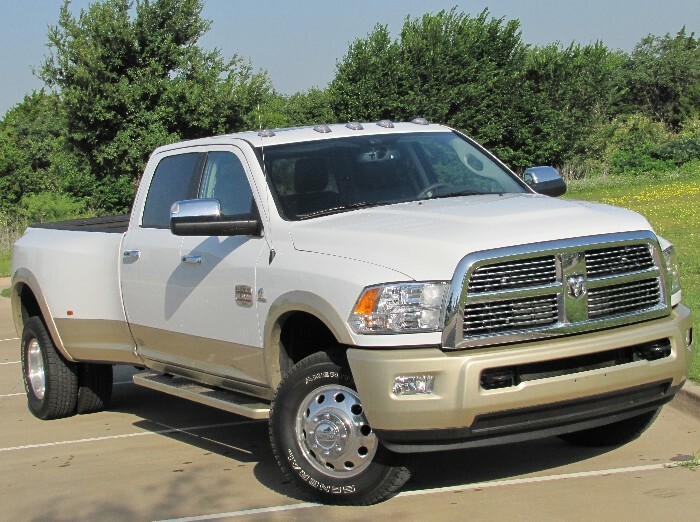 Recently a Laramie Longhorn-laden Ram 3500 Heavy Duty dually landed in my driveway for a week for me to opine. OK, let’s get serious. 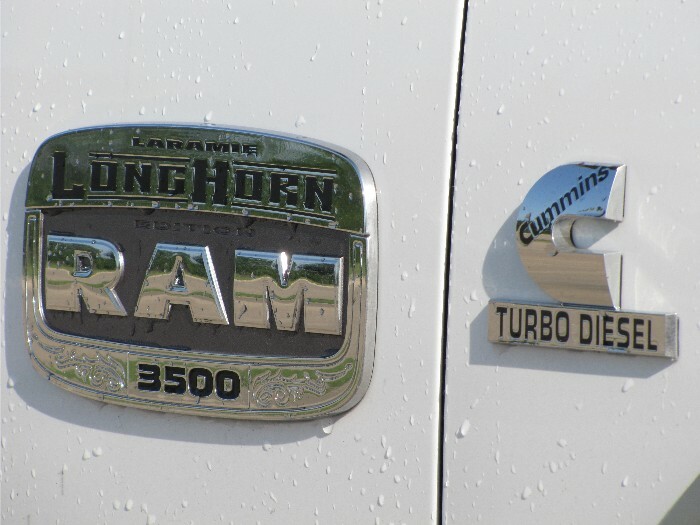 Does the new Ram Laramie Longhorn have the goods to take on the longtime Texas favorite King Ranch package from Ford? Depends on your tastes and which part of the rodeo (and cut of beef) you prefer. For those who prefer bull riding, calf roping and good old ribeye on the grill, King Ranch is going to be your baby. If you enjoy the barrel racing, trick riding and filet mignon, you are most likely a Laramie Longhorn candidate. The fellas at the barbershop are a mix of cattle- and horsemen but all were in agreement the fancy design and stitchwork inside the new Ram was a bit much for everyday. This was a truck for stepping out on the town at the denim and diamonds balls or the fancy new honkytonk uptown. Not too many of these will be found outside the local diner at dark-thirty in the a.m. on the daily run for coffee and biscuits. Ram folks kinda echo that in their statements. 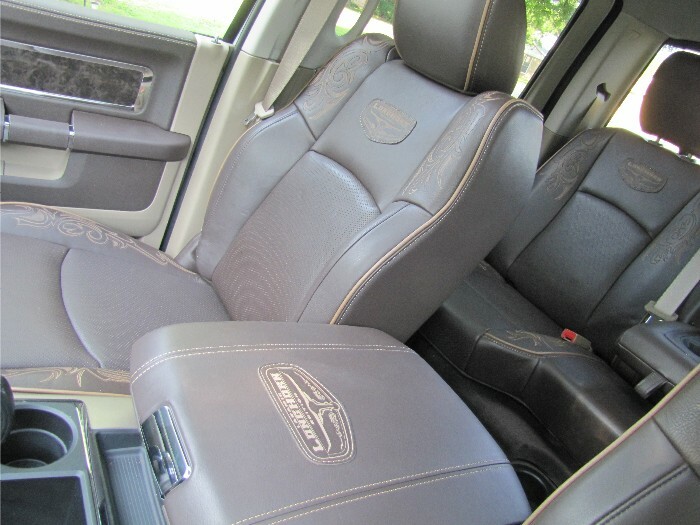 They launched Laramie Longhorn with quite a bit of fanfare as I mentioned above and the media in attendance at the State Fair even received belt buckles matching the new special edition badging that adorns fenders, tailgate, center console and seatbacks. The new Ram Laramie Longhorn is attractive. Some even compared the design work to that found on the chaps and saddles of Vaqueros (Mexican cowboys). 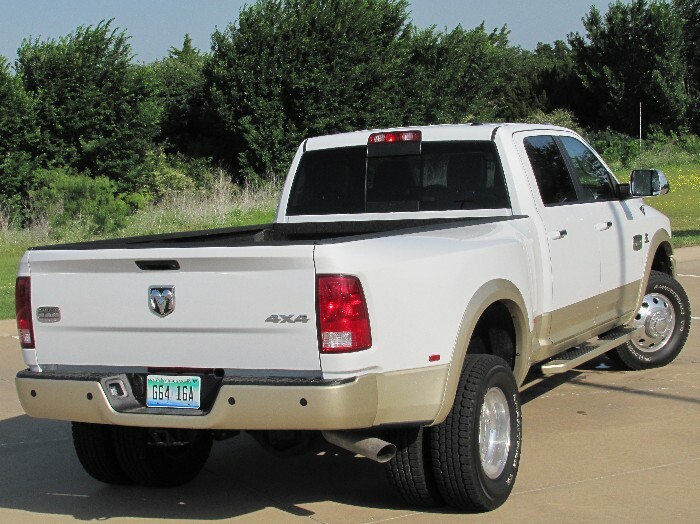 Whatever your impression, Ram now offers an alternative to Ford’s King Ranch package. Underneath it is still all Ram truck and our tester came with the latest Cummins diesel powertrain taking full swings at the competition. The truck wars may never end. For some they never began but here in Texas, the No. 1 truck market, competition is fierce and Ram has upped its game with the new Laramie Longhorn edition. 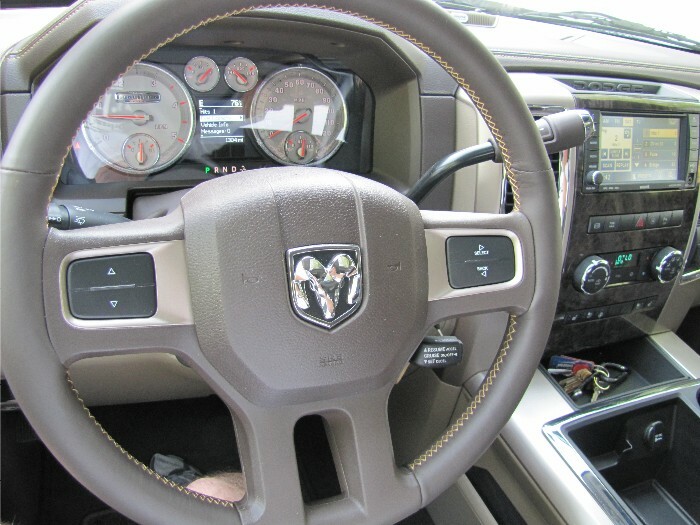 Pricewise the 2011 Ram 3500 Laramie Longhorn Crew Cab 4×4 dually we tested came in with a final sticker of $59,310 which I felt very reasonable when comparing against the competition. The last King Ranch Super Duty dually we looked at was about 10 grand more than that.